Most users commented on how comfortable the Primeknit material on the Adidas Yeezy 350 Boost upper. The comfortable full-length Boost sole was praised by the majority of users. Many positive reviews were noted on the full-length Boost sole because of the impressive cushioning, shock absorption and energy release features. Several users commented that the $200 price is reasonable and a good value for a highly-coveted shoe. A lot of reviewers find the Adidas Yeezy silhouette unique and trendy. The sock-like full-length Primeknit material hugs the feet providing support and protection in the upper, says a big number of commenters. Some users love the stretchy Primeknit upper as it is flexible enough for a variety of movements. A few mentioned the air vents at the bottom provide great air ventilation inside the shoe. A huge number of customers commented on the impeccable quality of the shoe as no loose threads or defects were noticed on the Adidas Yeezy 350 Boost sneaker. Some appreciated the cozy and soft in-shoe feel making extended wear bearable. A huge lot love this pair of Yeezys because it reflects Kanye West’s streetwear style and fashion sense. A good number of reviewers online like the unique pattern of the Primeknit upper which makes the shoe even more stylish and trendy. Some commenters find the Yeezy and Adidas detail on the sides and the pull tabs are too much detailing for the shoe. An online reviewer said the heel part is fleecy while the Primeknit upper lacks support and cushioning. Many people complained of the overpriced shoes especially among resellers selling them for twice or thrice its SRP. 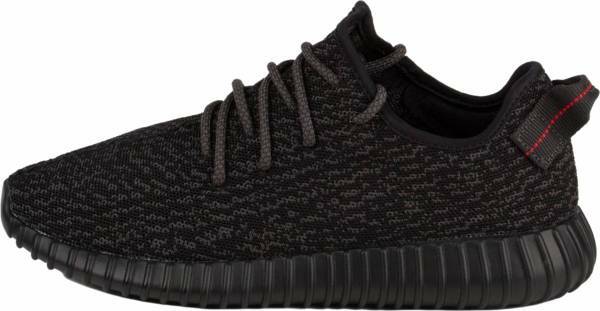 For a hugely hyped sneaker, the Adidas Yeezy 350 Boost is a great buy if you want to be part of the chic and trendy crowd. Kanye West’s masterpiece does not disappoint with its full-length Boost and stretchy Primeknit upper. The Boost sole does not only make the interior feeling comfortable but also it offers shock protection and energy release. These popular kicks may now be hard to cop with resellers hoarding them for a huge sum but it is a must buy creps for real hypebeasts. After a successful collaboration with Louis Vuitton and the huge hit with the Nike Air Yeezy I and Nike Air Yeezy II, no one would doubt rapper Kanye West’s vision for footwear. But on a random Sunday on February 9, 2013, Kanye packed his bags citing “creative differences” with Nike and turned to its fiercest competitor Adidas to continue his footwear design legacy. The rapper-musician never made a mistake. The anticipation for the release of the shoe coming out from the new collaboration has also ruled in Adidas’ favor. The Yeezy Boost 750 was the first to be released with designs that indeed showed more creative freedom. The shoe featured a clean suede high top upper and an off-white full Boost sole that created much of the hype. A zipper on the side and a cross-strap also secure the upper shoe giving a secure fit. Added bonuses for every purchase are dust bags and extra laces. After its release, the Yeezys also featured in Triple Black, Grey Gum, and Chocolate colorways. Many of the earlier designs of the Yeezys were a result of the collaboration between Adidas’ creative director Nic Galway and the design prowess of Kanye West. Probably the most popular of Kanye’s collaboration with Adidas’ Galway is the Yeezy Boost 350. Released in 2015, the low-top design of the Adidas Yeezy 350 Boost features an off-white boost sole and a Primeknit upper, combining two new technologies being used by Adidas. The shoe first came out in Turtle Dove colorway and created buzz among sneaker fans who would love to don the newest fashionable footwear they can get their hands on. Soon limited edition colorways were released including Black pirate, Moonrock, and Oxford Tan colorways were then released a few months later enjoying the same success and patronage from sneakerheads retailing for more than a thousand dollars and raking much more from resellers. Banking on the success of the first version, Adidas released the Yeezy Boost 350 Version 2 or V2 in 2016. Kanye slightly tweaked the design with a higher heel and sole. He also removed the pull tab and suede detailing in the second version design. The shoe first came out in Beluga colorway and was followed up with Copper, Red, Oreo, Zebra, and Bred colorways. Following up the success of the two Yeezys, Adidas and Kanye West recently veered away from the sneaker mold and released the Yeezy Boot 950. The boot features a pull tab on the heel, thick sole with deep grooves with an alternate Adidas and Yeezy branding on the tongue and the outsole. Colorways for the shoe include Turtle Dove, Peyote, Moonrock, Black and Chocolate for men and women. Highly fashionable, trendsetting, and a crowd pleaser, these are just some of the things that describe the Adidas Yeezy 350 Boost. The unique Primeknit pattern was first primarily released in Turtle Dove colorway which instantly became a hit not only because of its kickass looks but also for the comfort it brings to the wearer’s feet. The Adidas Yeezy 350 Boost silhouette easily became a hit as it uses the Boost sole unit to guarantee that the sneakers maintain a soft, comfortable, and lightweight cushioning. Many of those who embrace the street style and hip-hop lifestyles of the popular Yeezy 350 Boost tend to patronize this comfortable footwear now worn by sneaker fans and celebrities alike. The one-piece Primeknit material of the Adidas Yeezy 350 Boost keeps the feet entirely in place inside the shoe and fully secured by a round shoelace and a pull tab at the heel for easy entry and exit. Unisex sizes are available for men and women starting from US size 4 to 16 with a medium width. For this popular sneaker, the most popular features would probably be the one-piece Primeknit upper material and the Boost midsole. For the Adidas Primeknit, the yarn is knitted and fine-tuned to cater exactly to the areas where there is a need for flexibility and a wide range of movements resulting in a stretchy and sock-like material that literally covers the entire upper. Another technology that has revolutionized footwear is the Prime Knit material being used in the shoes. Primeknit technology involves creating quality and ultra-lightweight kicks that lessen fusing of numerous materials such as leather and mesh. The Primeknit fuses together yarn giving Adidas the ability to customize the shoes for the amount of flexibility, fit and stability that an athlete needs. The technology results to a shoe that resemble that of a sock wrapped around the wearer’s feet making athletes perform lighter, faster and at the peak of their game. Meanwhile, the Boost sole uses bundled thermoplastic polyurethane or TPU for the midsole. This material compresses under pressure for shock absorption and allows a responsive bounce back to its original shape. The Boost at the sole of the shoe is further enhanced as it is encapsulated inside the Tubular rubber sole that Adidas top designer Nic Galway claims the technology existed as early as the 1980s. The Yeezy 350 Boost’s outsole was designed and patterned after the interior tuning of a tire. This technology gives the shoe more grip and traction. Kanye Wests’ wife Kim Kardashian has extensively worn the Adidas Yeezy 350 Boost together with other celebrities that include Carlo Gomez, Pete Wentz, Kylie Jenner, Jim Jones, Big Sean, and DJ Khaled. The shoe has suede patches on the side containing YZY and Adidas branding details.